Wash and cleanse your hair with a straightening shampoo that is gentle on the strands. Apply a good conditioner to make it smooth and frizz-free. This will also help you provide protection to your locks during straightening to some extent. Make use of a simple t-shirt or a microfiber towel to soak the excess water from your hair. It should not contain oils and silicone in huge amounts. A dime-sized drop should be enough. Rub the product in between your palms and apply to your hair from the bottom up, while combing it with your fingers. Skip 2.5” to 3” section of hair from your scalp while applying it. The direction of the blows matters the most, when it comes to avoiding frizzes. 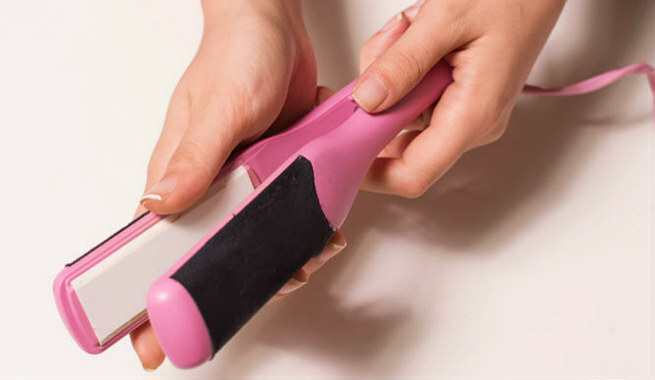 Keep the nozzle downwards while pulling the hair flat with a round-bristle brush during the task. Change hot and cool settings of the dryer whenever required in order to prevent overheating or burning of hair. Part your hair in the middle from ear to ear. Then, part those two sections into two more halves to create four equal sections of hair. Clip all four sections separately to keep them apart from each other so that you can work on them individually and get better results without damages. Use a low setting (less than 300 degrees) for ironing chemically treated, damaged hair with fine or superfine texture. It can go up to 350 degrees if the hair texture is thick and curly. For natural hair of regular texture, the ideal ironing temperature should be between 300 degrees and 380 degrees. Go for a higher setting (from 350 degrees to 400 degrees), if your hair is thick and super curly in texture. Focus on one section of hair at a time and divide each of them even into smaller sections (width around 1”- 2”) during the procedure. Use a brush or your fingers to pull the sections taut and drag the iron through them with ease. 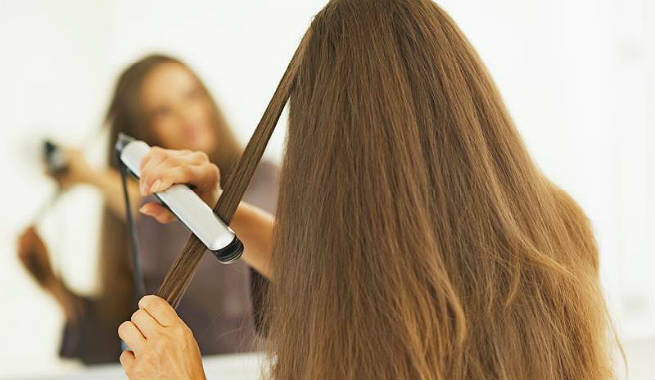 Start ironing at your hair roots and move towards the ends as you go. Never ever touch the iron with your scalp. Do not move the iron over and over the same section of hair. Finish your job tactfully so that your just-straightened hair does not curl up over time and you do not end up spoiling all your efforts. Let your straightened hair cool down properly. Apply a de-frizz serum or cream to keep up the sleek and polished look. Spray a light-hold hairspray onto a boar-nylon brush and comb it through your hair for uniform distribution. Damage-free, straight and gorgeous hair is all yours!